Zirconium silicate (or zircon) is extremely stable (refractory, hard, dense). Large quantities of zircon are used by the tile, sanitaryware and tableware industries. Individual zircon particles are angular, very hard and refractory and amazingly, they do not readily dissolve into glaze melts even when ball milled to exceedingly small particle sizes. Zircon is the generic name for zirconium silicate, the trade names are different (for example, Zircopax, Zircosil). The refractive index of zircon is high (particularly with micronized zircon, size less than 5 microns). Notwithstanding this, some sources list Zircon as a source of SiO2 in glazes (meaning that it does decompose). This view is plausible since smaller amounts of zircon do not opacify glazes, in fact they are purposely added to raise refractive index to encourage transparency and high gloss. That means it dissolves when percentages are low and precipitates to opacify when they are higher. Interestingly, it dissolves so well at low percentages that is is sometimes added to clear glazes to make them more transparent (because it has a high refractive index). Zircon is normally used in glazes for opacification (converting a transparent glaze to an opaque). The silicate form or zirconium does not matte glazes (like pure zirconium oxide does). 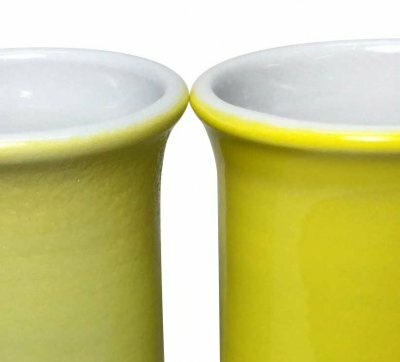 The exact amount needed varies between different glaze types. 10-12% is normal, but up to 20% may be required to opacify some transparent glazes. When the saturation point is achieved crystallization begins to occur. It is most effective at low temperatures. Tin oxide can be a more effective opacifier than zircon (it has various advantages and disadvantages). High amounts of zircon opacifier can cause cutlery marking (because of abrading angular micro-particles projecting from the glaze surface). As a glaze opacifier the white color produced by zirconium silicate is often characterized as 'toilet bowl white'. Tin oxide, by contrast can produce more of a blue-white, but tin is subject to alteration of the color (toward pink) if there is any chrome in the kiln atmosphere (zircon is unaffected by this). If the shade of white is too harsh, it can be toned by shifting part of the opacification burden to tin or by adding a tiny amount of stain (e.g. blue, brown, grey). Its low expansion will tend to reduce crazing in glazes. In a non-crazed glaze, the presence of sufficient zircon can reduce thermal expansion enough that there is a danger of shivering (the glaze formulation may need to be adjusted to accommodate, e.g. more Zircon lowers glaze thermal expansion). It is often best to exclude the chemistry of the zircon materials from participation in glaze chemistry calculations, treating it simply as an addition (then take into consideration its effect on glaze properties on a physical rather than chemical level). Zircon stiffens the glaze melt (increases surface tension) and this often needs to be taken into account (even though the chemistry might suggest it is sufficiently fluid). Glazes lacking melt fluidity can experience problems with crawling, blistering and pinholing since they have less ability to heal disruptions. Adjustment of the glaze chemistry may be needed (increasing the flux content while maintaining the SiO2:Al2O3, for example). 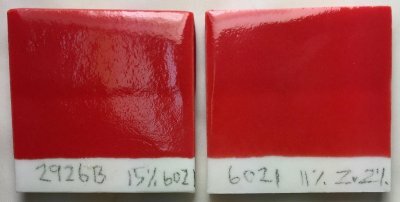 There is a clear relationship between glaze color and opacifier content. Transparent glazes have depth, thus any colorants present produce deep and rich color (if the glaze does not crystallize of course). But when an opacifier is added to the glaze, the color depth is affected (according to the percentage employed). Thus a rich blue can turn into a dull pastel blue in a fully opacified glaze. Also, unlike opacified glazes, the intensity in a colored transparent glaze varies according to thickness (twice as thick will be twice as dark); this phenomenon is often exploited for decorative appeal. Because of its high thermal stability zircon is also employed in making various hi-tech refractories, porcelain bodies, coatings and materials. It is a major source for the production of zirconium oxide ZrO2. Calcined alumina is an alternative in fabricating super refractories but it has much higher thermal expansion and greater heat conductivity. Zircon sand (which is milled to produce zirconium silicate powders) has become so expensive that major manufacturers are considering, or are already diluting their products with other materials (like kaolin). So 'heads up' if your glaze is not as opacified as it was before! Also, use care in pretesting zircon materials, they vary in quality. A very low expansion material. Zirconium silicate is by far the most popular opacifier in glazes. It is available from many manufacturers. Opax, Ultrox, Zircopax and Superpax are examples of trade names of zirconium silicate and zirconium oxide products. The finer the milling of the material the better the opacity and the cleaner the color that will be produced. How do you turn a transparent glaze into a white? 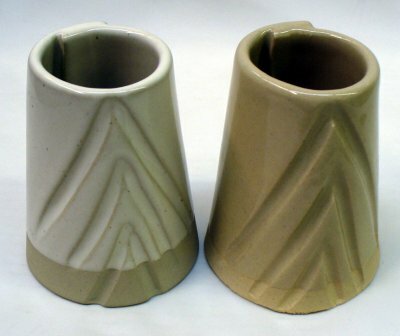 Right: Ravenscrag GR6-A transparent base glaze. 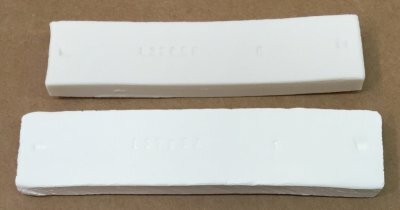 Left: It has been opacified (turned opaque) by adding 10% Zircopax. This opacification mechanism can be transplanted into almost any transparent glaze. It can also be employed in colored transparents, it will convert their coloration to a pastel shade, lightening it. Zircon works well in oxidation and reduction. Tin oxide is another opacifier, it is much more expensive and only works in oxidation firing. On Plainsman H443 iron stoneware in reduction firing. Notice Tin does not work. 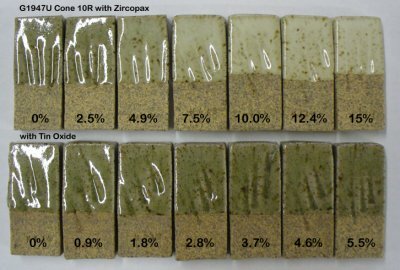 Also notice that between 7.5 and 10% Zircopax provides as much opacity as does 15% (Zircon is very expensive). Opacifying a cone 10 reduction magnesia matte glaze. On the left: G2571A dolomite matte, a popular recipe (from Tony Hansen). Right: 10% Zircopax has been added. Both are on a buff stoneware (H550 from Plainsman Clays). The top fired bar is a translucent porcelain (made from kaolin, silica and feldspar). It has zero porosity and is very hard and strong at room temperature (because fibrous mullite crystals have developed around the quartz and kaolinite grains and feldspar silicate glass has flowed within to cement the matrix together securely). That is what vitrified means. But it has a high fired shrinkage, poor thermal shock resistance and little stability at above red-heat temperatures. The bar below is zirconium silicate plus 3% binder (VeeGum), all that cements it together is sinter-bonds between closely packed particles (there is no glass development). Yet it is surprisingly strong, it cannot be scratched with metal. It has low fired shrinkage, low thermal expansion and maintains its strength and hardness at very high temperatures. 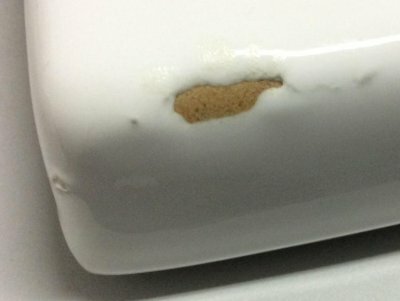 This is also a common problem at low fire on earthenware clay (but can also appear on a buff stonewares). 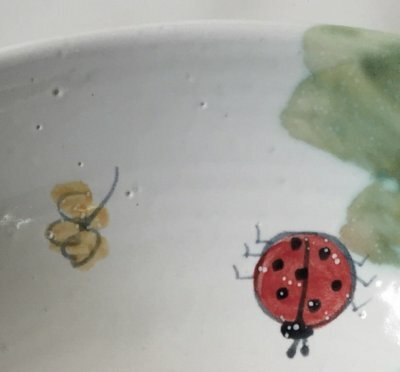 Those white spots you see on the beetle also cover the entire glaze surface (although not visible). They are sites of gas escaping (from particles decomposing in the body). The spots likely percolate during soaking at top temperate. Some of them, notably on the almost vertical inner walls of this bowl, having not smoothed over during cool down. What can you do? Use the highest possible bisque temperature, even cone 02 (make the glaze thixotropic so it will hang on to the denser body, see the link below about this). Adjust the glaze chemistry to melt later after gassing has finished (more zinc, less boron). Apply a thinner glaze layer (more thixotropy and lower specific gravity will enable a more even coverage with less thickness). Instead of soaking at temperature, drop 100 degrees and soak there instead (gassing is much less and the increasing viscosity of the melt overcomes the surface tension). Use a body not having any large particles that decompose (and gas) on firing. Use cones to verify the temperature your electronic controller reports. These are fired around cone 8. On the far right is 15% zircopax (left has none). Zircon is however very expensive and its use on bricks has to be rationalized, or at least minimized. In this case a white engobe applied first would greatly reduce the zircon percentage needed. 3% and 2% zircopax added to G2926B cone 6 clear. Why? The outside glaze is a copper blue, but that is not the one we are interested in here. 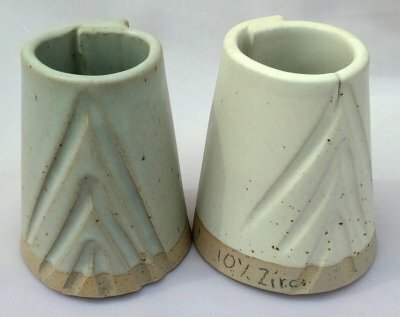 It is the clear glaze on the insides of these two identical cone 6 porcelain mugs. Why add such a small amount of zircon to it? It is not being added to opacify, it is being added to toughen the surface and reduce the thermal expansion.The presence of the 2% zircon has not affected the gloss or transparency of the glaze on the right. However the 3% on the left has opacified it just slightly and made the surface a little silky. So that is too much for this glaze (although it might be OK if the melt fluidity was higher). So, if you are interested in the most functional possible surface, consider a 2% zircon addition to your transparent. These are cone 03 porcelains with G2931K clear glaze base plus Mason 6021 encapsulated stain (which is very expensive). The one on the left has 15% stain added. The one on the right is slightly less dense red but has only 10% stain plus 2% zircon (zircopax). Notice the zircon has smoothed the surface also, this is a known benefit of using it with encapsulated stains. The 2% addition is not enough to opacify, the color remains deep and translucent. But the surface is still not completely smooth and glassy as is the base transparent glaze on its own. This can be improved using a drop-and-hold firing schedule. It has no definite melting point of zirconium silicate, but decomposition into zirconia and silica begins at 1550°C.